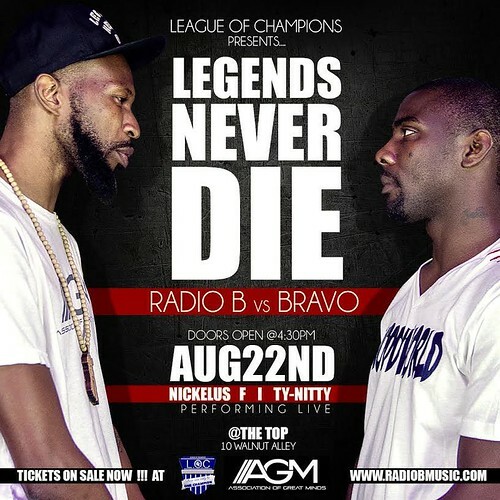 League of Champions and Association of Great Minds present Radio B versus Bravo at the appropriately named “Legends Never Die” battle event. Both well known in the Richmond area, Radio & Bravo exchange bars, jokes, wit and skill to determine who reigns supreme. Hit us up on Twitter and Facebook to let us know who you think walked out victorious. Radio B unleashes an impeccable piece of work via the soulful production of Cashby. Radio B is a living, breathing, evolving vehicle of music. He became well known and respected on the hip hop scene in Richmond, VA at a young age. The video for “The Life” was directed by Monsee and the track was produced by NameBrand. Radio B’s Live Good Be Great featuring “The Life” is available for free download.